You read that right: it’s soup weather in Seattle again. And you read the other part right, too: this soup is made from carrot tops. Don’t worry, Harold McGee says they’re probably safe to eat. The recipe comes from Deborah Madison’s Local Flavors and it’s my favorite kind of soup recipe. The star of the show here is a single bunch of young carrots, from top to root tip. Pick a perfect bunch next time you’re at the farmers market (a rainbow bunch is always attractive, but these delicate orange carrots came from our Nash’s CSA). Show those carrots off by making such a simple soup that the carrot flavor gets to shine. The frilly, spring-green carrot leaves highlight the vegetal notes that underlie the carrots’ sweetness. A handful of herbs, a few spoonfuls of rice for body, and the soup makes the water you add into its own rich broth. Carrot Top Soup: Prepare your soup ingredients in advance, including plucking the tender frilly carrot leaves from the stems of six medium carrots (don’t use tougher-looking leaves or any stems). Melt 2 Tb. butter in your soup pot. Add two thinly-sliced leeks (use the white and light green parts; save the dark green tops for stock! ), six thinly sliced or finely diced carrots, the carrot leaves, two good sprigs of thyme, a handful of chopped parsley, and 3 Tb. uncooked white rice. Saute for a few minutes without letting the ingredients brown, then add 6 c. water and 1 1/2 tsp. salt. Bring to a boil and then simmer gently for about 20 minutes, until the rice is cooked. Fish out the thyme stems and taste for salt. Serve each bowl of soup sprinkled with more chopped parsley. This entry was posted in Food, Recipes, Soups, Vegan or Would-Be-Just-As-Good-Vegan and tagged are carrot tops edible?, carrot recipe, Seattle weather in late July, soup recipe, summer CSA recipes on July 23, 2012 by emmycooks. I’ve been wondering about using carrot leaves after having succesfully used leaves from radishes. I should probably get organic carrots for this as I am sure the regular ones will be loaded with pesticides. All joking aside, until today, I had only ever seen that NYT blog post about the tops being toxic. Thanks for the link with Harold McGee’s response! Millions of people have eaten tons of carrot tops and I don’t think anyone has been poisoned yet. This looks amazing, Emmy! And a great use of the whole vegetable! I think anything you eat or drink in massive quantities can be toxic. Even water can kill you if you drink too much. Carrot tops seem fine to me! LOVE Local Flavors! One of my favorites! This looks great. Have not heard of carrot tops could be toxic. When I was little I took the carrots out of my grandmother’s vegetable cultivation, rinsed them and just took of the thread narrow peak at them and threw the stump with their foliage when I was finished. Just as she taught me and have never noticed any difference, even on those that are purchased in the grocery store with, I have scaled before I had eaten or cooked them. A carrot out of the ground is quite a treat! What a nice childhood memory. I was just saying I want to make carrot soup after seeing a beautiful puréed variety in a gourmet market. Maybe I’ll start with this one. Looks great! I love the notion of using the carrot leaves. If our heat wave ever ends, I’ll give it a try. For now, the only soups I’m whipping up are ice cold! Yum! I keep seeing gazpacho recipes and thinking…well, maybe when it warms up. Stay cool! I was wondering if the carrot tops were edible just yesterday. I prematurely plucked a carrot from the garden and knew I had to do something other than just compost it. Thank you for opening the door of carrot tops! I hope they are! I have felt no ill effects from eating this soup for years. :) Let me know if you take them on other adventures! I have a friend whose mother-in-law has evidently been making sauteed carrot greens for 50 years. 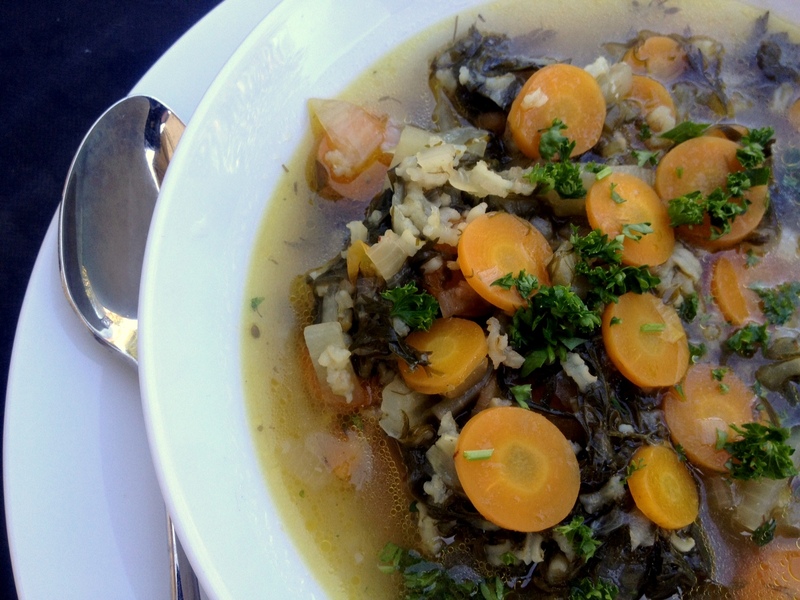 Love this soup idea–it’s almost like nose-to-tail, only with vegetables! I love the idea of using carrot leaves too, a great way to use everything. This looks great! Nash’s Sweet Carrots are AMAZING! I KNOW! That’s how we fell for them and now we’re hooked. :) We were so excited when they started offering their CSA in Seattle, we really like it. Right…like don’t eat the carrot’s relatives, apparently: http://topics.blogs.nytimes.com/2009/07/13/the-toxic-salad/ !!! Oh wow, see I’ll just do what you do!